To open the dashboard view, do one of the following. Click InLoox PM tab on the Outlook Ribbon and then Dashboard, in the Views group. 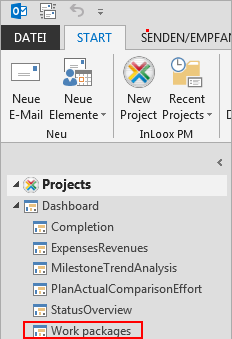 In Outlook 2007, click InLoox PM Folder in the InLoox PM Toolbar and then Dashboard in the InLoox PM project list. Click Dashboard in the tree structure on the left. 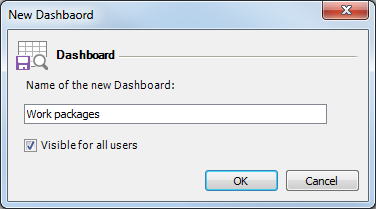 In InLoox PM ribbon, on the Start tab, in the Actions group, click New Dashboard. In the New Dashboard dialog box enter a name. Activate the check box, if you want to make your dashboard visible for all users. This will invoke the Dashboard Designer dialog box. For more information about it, see Designing dashboard. Wenn the new dashboard is ready, click Save and Close in the Dashboard Designer, on the Home tab. The new view is displayed in the Dashboard tree view on the left. Create a new dashboard | InLoox 9 for Outlook • Copyright 1999-2019 © InLoox, Inc. All rights reserved.